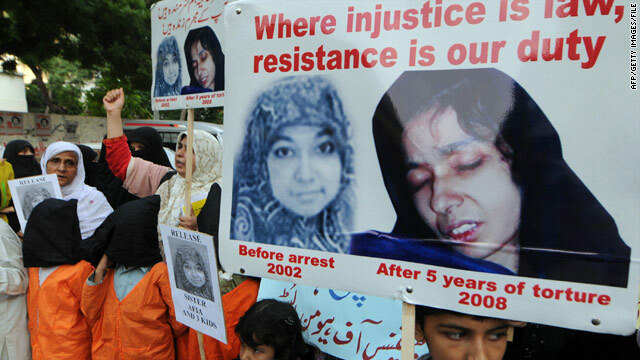 Pakistanis carry posters of Aafia Siddiqui in a demonstration in Karachi in 2008. New York (CNN) -- A jury has begun deliberating in the case of a Pakistani scientist accused of trying to kill U.S. officers. The jury began deliberating Monday in the trial of Aafia Siddiqui, who is charged with attempted murder and assault for allegedly shooting at U.S. officers while she was in Afghan custody. She allegedly shot at two FBI special agents, a U.S. Army warrant officer, an Army captain and military interpreters while she was being held unsecured at an Afghan facility on July 18, 2008. Afghan police had arrested her a day earlier outside the Ghazni governor's compound after finding her with bomb-making instructions, excerpts from the "Anarchist's Arsenal," papers with descriptions of U.S. landmarks, and substances sealed in bottles and glass jars, according to a September 2008 indictment. The indictment said Siddiqui had "handwritten notes that referred to a 'mass casualty attack'" listing several locations in the United States, and "construction of 'dirty bombs.'" The notes also "discussed various ways to attack 'enemies,' including by destroying reconnaissance drones, using underwater bombs, and using gliders," the indictment said. "Siddiqui also possessed a computer thumb drive that contained correspondence referring to specific 'cells,' 'attacks' by certain 'cells,' and 'enemies,'" the indictment said. "Other documents on the thumb drive discussed recruitment and training." Siddiqui -- whom the FBI had sought for several years for suspected ties to al Qaeda -- was extradited to the United States in August 2008. Since 2003, the whereabouts of Siddiqui -- an American-educated neuroscientist -- had been the source of much speculation. According to Amnesty International, Siddiqui and her three small children were reported apprehended in Karachi, Pakistan, in March 2003, shortly after the FBI issued an alert requesting information about her location. Several reports indicated that Siddiqui was in U.S. custody after her arrest in Karachi. But in May 2004, then-Attorney General John Ashcroft and FBI Director Robert Mueller identified Siddiqui as being among several sought-after al Qaeda members.